Liberal Senator Invites 'McCain Republicans' to Vote For Democrats in 2020. No Thanks. As you've likely heard, President Trump is still taking potshots at the late Sen. John McCain, seven months after the Arizonan's death. Some of his attacks were gross and unbecoming while McCain was still alive; they're even more uncalled for and indefensible today. McCain had real flaws, both as a man and as a politician, but he was a bona fide hero who endured horrendous torture at the hands of Communist captors, famously declining special treatment offered to boost enemy propaganda and demoralize fellow American prisoners. Given his towering personal sacrifice, and his not-alive status, there is no reason whatsoever to maintain this ugly public spat. One cannot counter-punch a dead person, and efforts to justify this nasty and petty impulse range from strained to outright pathetic. In theory, this might be a tempting prospect. Indeed, in McCain's home state, a sizable percentage of registered Republicans crossed over and supported the Democratic Senate nominee last year. This group enabled a narrow victory for Krysten Sinema, the first Democrat to win an Arizona Senate seat in 30 years. But Sinema, despite her more radical past, ran as a centrist. That is not the direction of the national Democratic Party today. How are right-leaning voters supposed to pause fighting about "normal stuff" when Democrats are aggressively supporting extreme late-term and even post-term abortion? When they're rallying behind plans to end private healthcare for 177 million people and permanently put the government in charge? When they're denying basic math while demonizing any semblance of fiscal sanity? When they're increasingly hostile to fundamental rights enshrined in the first two amendments to the constitution? When they're whitewashing bigotry in their own ranks, cowering before their intersectionality fetishist base? These are not minor quibbles. Some argue that even passionate and deep philosophical and political differences must take a back seat to the preservation of imperiled norms. It's a fair point. But why would we elect Democrats to "stabilize the republic"? It's true that Trump can be a destabilizing force, but much of the Left's response has been to challenge and attack major pillars of American norms and institutions that they've decided are obstacles to their perceived birthright of power. They're therefore playing footsie with court-packing, demanding an end to the electoral college, and seeking to allow children to vote. These are not fringe ideas within their party anymore. Supreme Court "reform" is becoming a presidential litmus test, as is electoral college abolishment. The Speaker of the House explicitly endorsed expanding the franchise to high school sophomores. And the rumored leading contender to be the Democratic 2020 frontrunner's ticket mate is a conspiracy theorist who refuses to accept the results of her electoral loss. If Democrats were to nominate the left-leaning version of John McCain, renounce radical policies (at least temporarily), pledge to forego country-altering systemic power grabs, promise not to pursue any party-line, big-ticket agenda items for four years, and warmly signal that people with traditional values are actually welcome, as opposed to 'privileged' or evil, Schatz's idea might gain more currency with his intended audience. I, for one, would consider it, even though I wouldn't necessarily classify myself as a "McCain Republican." If the premise is that Trump is so dangerous to our norms that a cross-partisan coalition must work together to defeat him, then Democrats should be glad to put ideological goals and projects on the back-burner for a few years, then resume the contest of ideas over "normal stuff" ahead of 2022 and 2024, right? Does a single soul believe they have any intention of doing so? It's abundantly clear that they have no such designs. We can see who they are and what they'd do; they're showing and telling us every day. 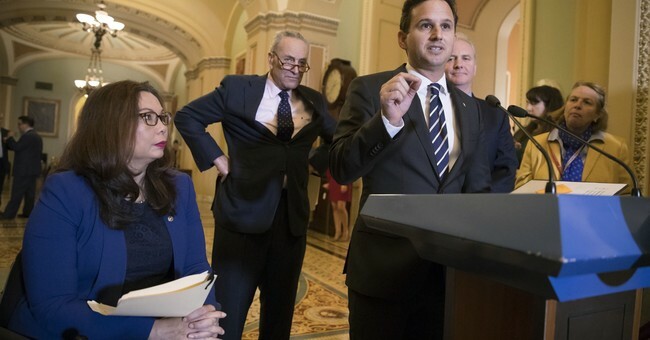 So my firm answer to Sen. Schatz is quite simple: Hard pass.